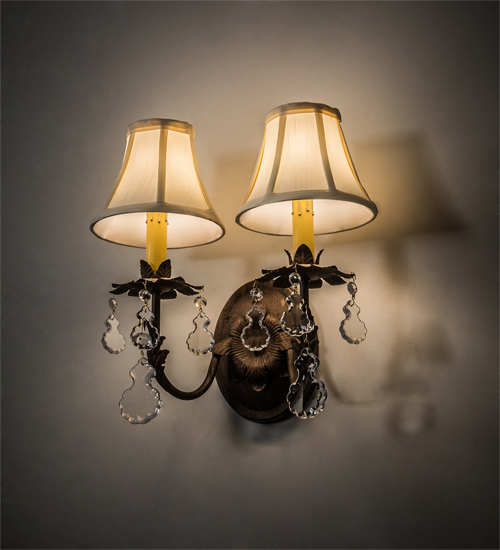 Description: An elegant wall sconce design comes to light with sparkle and glamour. Two Amber faux candlelights are topped with Cream Textrene trumpet styled shades perched on floral bobeches. The shades are embraced by exquisite curved arms featured in a Cortez Gold finish. Matching Acanthus leaves, crystal droplets and scrollwork grace this lovely fixture. Handcrafted by highly skilled artisans in our 180,000 square foot manufacturing facility in Yorkville, New York. Available in custom sizes, styles, colors and dimmable energy efficient lamping options. The wall fixture is UL and cUL listed for dry and damp locations.